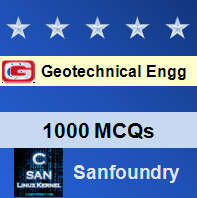 This set of Geotechnical Engineering Multiple Choice Questions & Answers (MCQs) focuses on “Site exploration”. 1. Which of the following is proved to be useful, ongoing over the site? Explanation: On going over the site, a study of the following features may be useful: local topography, excavations, cuttings, escarpments, flood marks and evidence of erosion. Explanation: The methods of site investigation are largely dependent upon the nature of the engineering project and the site. Explanation: Site exploration should yield precise information about the following: i) the order of occurrence and extent of soil and rock strata ii) the nature and engineering properties of soil, and iii) the location of ground water. Explanation: Exploration in general, should be carried out to a depth up to which the increase in pressure due to structural loading is likely to cause perceptible failure or shear failure. Such a depth is known as the significant depth. Explanation: Depending upon the details or the precision of the sub-soil data to be obtained, the site exploration may be classified as general (or preliminary) and detailed. 6. The general exploration gives information about which of the following features? i) Depth, extent and composition of soil strata. v) Compressibility of soil strata. Explanation: The depth of exploration at the start of the work or the significant depth, for pile foundation, should be 10 to 30 meters, or more, at least one and a half times the width of the structure. 8. What are the methods used for general exploration? Explanation: Exploratory borings, shallow test pits, subsurface penetration, soundings and geophysical methods are used for general exploration. Explanation: Penetration and soundings help in estimating the relative density and strength properties of coarse-grained soils and also to locate the weaker strata and lenses. Explanation: Depending upon the subsoil conditions the number and disposition of bore holes are varied, usually in the valley floor, on the abutment etc. Explanation: The field test may be conducted for determining the in-situ values of density, bearing capacity, shearing strength, permeability, and pore pressure. 12. The various method of site exploration can be grouped under, which of the following? Explanation: In general exploration, exploratory borings are carried out by auger, auger and shell and by wash boring.